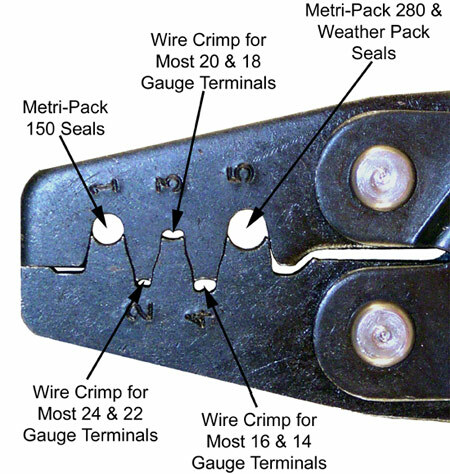 NOTE: Variations in terminal metal thickness, wire stranding, and insulation diameter may affect the ranges of the crimping tools described below. 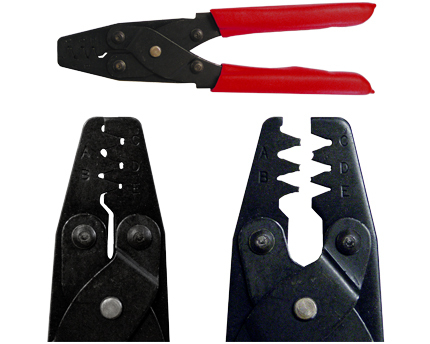 Our T-18 crimps Weather Pack terminals and seals, and the most popular sealed Metri-Pack 150 and 280 Series. Its compact, low-cost parallel jaw design eliminates terminal rocking. 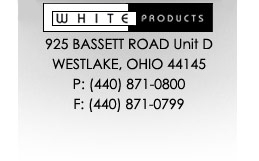 This tool is offered exclusively by White Products. 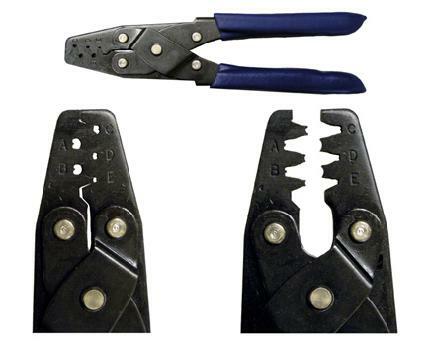 This is the "Easy Crimp" version of our popular T-18 tool that crimps the most common Sealed Metri-Pack 150, Sealed Metri-Pack 280, and Weather Pack terminals and seals. The new frame features a compound leverage mechanism and longer handles to provide a mechanical advantage that makes crimping a breeze. Five cavities crimp the smallest automotive OEM terminals, D sub-miniature contacts and the smallest terminal seals. Performs "B" type conductor crimps in maximum range of 30-16 AWG and "oval" type insulation crimps in maximum range of 30-16 AWG. Will crimp most 22 gauge (0.35 MMSQ) thin-wall terminals found in late-model vehicle wiring systems. Five cavities perform "B" type conductor and insulation crimps. Conductor maximum crimp range is 22-12 AWG. Insulation maximum crimp range is 24-14 AWG. The T-11 uses the same five crimp cavities as the professional Delphi/Packard 12085271 tool, but is built on a less expensive, non-ratchet frame. 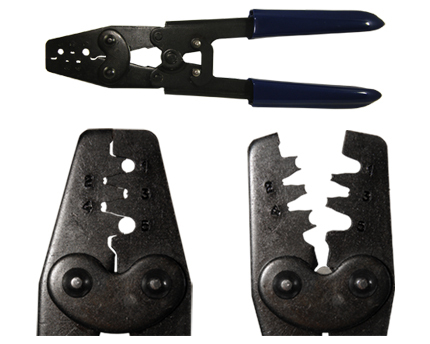 (For an exact equivalent to the 12085271, use our T-16 pro crimper.) The T-11 is our most popular crimping tool. A variation of our popular T-11 tool designed to reduce crimping fatigue with a compound leverage mechanism and longer handles. 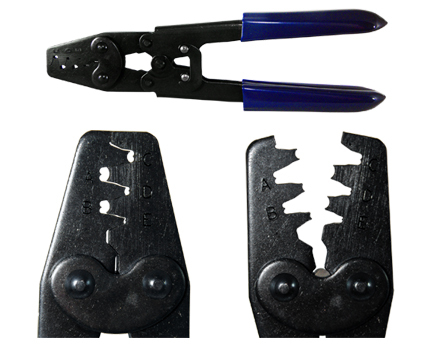 It is similar to the 12085271 crimper with the same cavity configuration and the same crimp range, but is built on a less expensive, non-ratchet frame. Performs "B" type conductor and insulation crimps. Conductor maximum crimp range is 22-12 AWG. Insulation maximum crimp range is 24-14 AWG. Very little effort is required to complete a crimp. With an overall length of about 9", the T-11E will easily fit into any toolbox.